We chose to design a barn quilt square depicting the old pop factory and display it on the actual building. 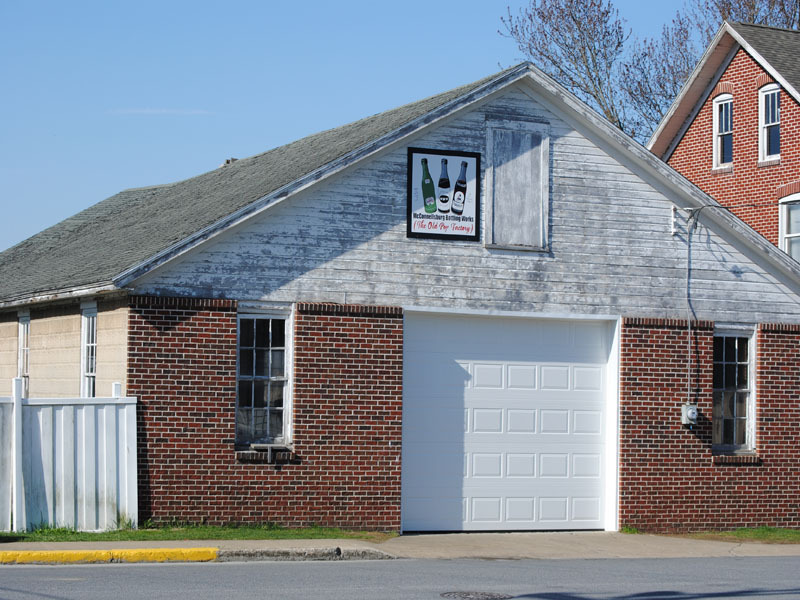 Few people know that McConnellsburg was home to the 1st pop factory in Fulton County or even know where it is located. Information about the pop factory is hard to authenticate. It was started in approximately 1937 by Raymond Wible. Wible ran the pop factory for about 11 years under Wible's Beverages. He was also the county sheriff from 1944 - 1947. He sold the business to Robert Hamil on Jan.5, 1948. On July 6, 1948, Hamil filed for a PA fictitious name, the name was "The McConnellsburg Bottling Works". Hamil sold the business and building to Robert Shimer in Aug. of 1954. Shimer operated the business for a few months until he shut it down due to a decrease in soda sales. Since 1955 the buiding has been used by various people for storage. It is currently owned by the Butts family and is used to house and restore Farmall and Cub Cadet tractors. During the years of operation many different bottles were used for soda. For our quilt square we chose a Bubble Up bottle. This is a dark green bottle with white bubbles on the front and Bubble Up written in red letters..The slogan for Bubble Up was " A kiss of lemon - A kiss of lime." We also chose a Squeeze bottle. Squeeze bottles featured a picture of a young boy and girl side by side on a swing. The slogan for Squeeze was "Had your Squeeze today ? "15 flavors of pop was bottled in these bottles. Bubble Up and Squeeze were trademarks, meaning they could be bottled in other localities. The last bottle we chose to display is the one most authentic to the pop factory. It was designed especially for McConnellsburg Bottling Works. It showcases the letters "MBW" on the front encased in an intricately designed square amid squiggly lines and the words sparkling beverages. This is all done attractively in black and white. The word McConnellsburg is printed diagonally around the neck, front and back, in white letters. We have not been able to discover what flavors of soda were bottled in these beautiful bottles. Pop was also bottled in "Icicle" bottles, green and clear bottles with embossed icicle images dripping down and around the bottle. These bottles have the words Wible's Beverages on them and also McConnellsburg Bottling Works around the bottom. Many locals worked at the pop factory during it years of operation. Children, grandchildren and cousins of the owners. Local high school boys worked after school and on Saturdays. They carried 100 lb. bags of sugar up the steep steps to the second floor. Upstairs was the big vat where the sugar and flavored syrups were mixed and stirred with a huge wooden paddle. The soda mixture then flowed via ducts/spouts to the ground floor where it was mixed with carbonated water and bottled in bottles that were sterilized by the employees. The soda traveled down a conveyor belt over a series of lights that showed any impurities in the bottle of soda and capped. Bottles that were considered unsaleable because of the impurities were pulled off the line by an inspector and set aside. Neighborhood children frequently visited the pop factory and were happy to consume the unsaleable sodas. The end product was then delivered around the county to stores, restaurants and bars. Deliveries were made as far north as Shade Gap and as far south as Wardfordsburg catching all of the in betweens customers.